Do you remember the good old radio of your grandfather? It was pretty easy to use: you just had to switch it on and enjoy the music. Mentor.FM is an attempt to keep that simple approach but at the same time powering the radio with new technologies. The very first version of this radio came out for a short period in 2011, as an academic research experiment in the Music Recommender Systems field carried on by its author, Eugenio Tacchini. Eugenio Tacchini is a software developer, entrepreneur, College lecturer and researcher; he got a Ph.D. in Computer Science studying Serendipity in Music Recommender Systems and he has been a visiting scholar at the University of California, Berkeley and at the Freie Universitat Berlin. 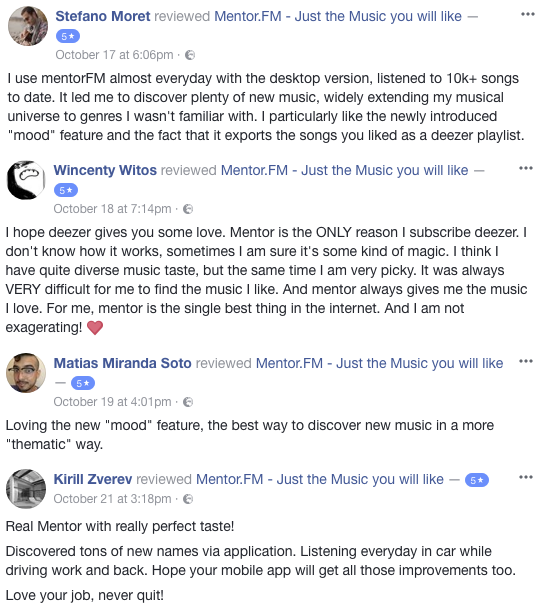 In November 2013, after months of research and development and the production of a patent-pending technology, Mentor.FM is out again as a real service available in 221 countries, to bring the music listening experience to a new level. Technically, Mentor.FM is a conversational music curator; think about it as your Music Mentor, like having a personal DJ who knows you and play not only the music you like NOW but also the music you still don't know and your are going to like IN THE FUTURE. Today there is so much music available that the problem is what to listen; we weren't satisfied with all the existing discovery/recommendation services, which tended to be too predictable and monothematic and needed too much user direct input. So we put all our passion for music and technology and our academic research experience to build a new product from scratch; simple, effective and powerful. We think that Mentor.FM already offers a unique listening experience; our to-do list, however, is impressive: we really want to provide the next generation of Automated Music Curators and we already know exactly where to go to achieve our goal. The usage is very simple: you login into the radio using your Facebook account and wait for the music to start. One click, that's all. Mentor.fm will work and play music based on your Facebook profile and other information coming from Deezer, Last.FM, 7digital, Google and combining everything using our own powerful algorithm. That's the NORMAL MODE and you are going to immediately like the vast majority of the music played. There is an alternative mode: the SURPRISE ME! mode: in this case the radio CAN propose songs apparently far from your current taste, touching music lands you usually don't explore. We think that people are often too stick to their musical taste so we have developed a method to propose new music, something that can help you discovering that jazz (or drum 'n' bass!) is not that bad, after all. This innovative method is still in beta and on ongoing development; we are going to release new improvements on a monthly basis and our adaptive engine also improves by itself during time. Music tastes are so fascinating and at the same time so complex that it takes time to understand them; think about a teacher who can teach better if he knows well his students and their talents. 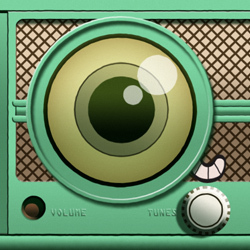 Finally, we have recently introduced an additional mode: the Mood mode: in this case the radio creates and plays a mood-based playlist trying to match your taste! You decide the mood based on how do you feel or what are you doing. For example Be Happy, Angry or Sunday Morning Breakfast are some of the moods. You can also call a mood playlist using a URL: for example https://mentor.fm/mood/Be_Happy starts a Be Happy playlist! The first time you use Mentor.FM you have to link your Mentor.FM account to your Deezer account, just click on "Link your Deezer account", you have to do it just once. If you don't have a Deezer account follow the instructions and you can can get one in a few seconds. 1) Do the LIKE/DISLIKE affect the music played by Mentor.FM? Sure, using the LIKE/DISLIKE buttons you teach the radio your taste, the more you use it, the better the radio works. Don't think too much about the consequences of a LIKE/DISLIKE, depending on various factors Mentor.FM will interpret your LIKE/DISLIKE in the right way, don't worry. 2) Is it possible to choose the song? No, this is not a juke box. Sometimes you need a juke box, sometimes you just need a radio. Mentor.fm is for the latter situation, just turn it on and enjoy the music. The idea is that you almost don't need the keyboard to use Mentor.FM. Yes. Mentor.FM streams songs provided by established music provider companies such as deezer.com. At the moment, yes. In the future we might introduce a commercial / freemium service. 5) Is there an iOS/Android Mentor.FM app? 6) In which countries is the service available? 7) Is it possible to use Mentor.FM without a Facebook account? No, at the moment Facebook is the only way to register and login to Mentor.FM. The preferences used to create a preliminary and first music profile are extracted from Facebook, Last.FM and Deezer and then enriched during the time by the user's behaviour. In general, we can just access the information you agree to share with us when you authorize the Mentor.FM application. Also, we cant't post on your wall without your explicit permission. 8) The radio freezes at "Checking your Deezer account" or "Loading playlist"
Probably your browser is not recent enough to use Mentor.FM without having Adobe Flash installed. Here you can check your Flash installation. Some users, however, are experiencing this problem even if the browser is recent or they have Flash installed. The first thing you can try is visiting www.deezer.com and then come back here and reload this page, this tells your browser that the cookies coming from deezer.com are "safe". Another thing you can try is: delete the Deezer cookies stored in your browser (here you can find instructions for Chrome, or you can contact us using the feedback button on your left), visit www.deezer.com and then reload this page. You have to do it just once. If you can't solve the problem please contact us. Please also check that your browser accepts Third-Party Cookies. The Mentor.FM Web site has been developed by Eugenio Tacchini (Recommendation algorithms, back-end) and Simone Magnaschi (front-end). The Android app has been developed by GeDInfo. Last.FM for providing some of the APIs we used. CubaGallery for the original radio picture. argya for the original Cup of Tea picture. Berkeley, Berlin, Commodore and The Prodigy for the inspiration. You can also use the feedback button you find on the left side of the site. Here is the list of 180+ countries where Mentor.FM is available. We are facing some technical problems today, you might experience a "30 seconds limitation" to the playback, everything should be fixed in next few hours. Sorry for the inconvenience. I am already playing something for you, a song by . We have built a first draft of your music profile using your Facebook account. • Normal: just plays music related to your taste. That's the standard Mentor.FM mode, the one that made it popular. No particular mood is set. • Mood: you set a mood (e.g. "Be Happy", "Engergetic", ...) and Mentor.FM creates a mood-based playlist, also trying to match your taste. That's a new feature! When you connect your Deezer account, we'll also import your Deezer Listening history (if any) into your Mentor.FM musical taste. We'll send a message to at the end of the process. Mentor.FM also learns from your behaviour when you use it. Your browser is not accepting cookies by Deezer, our streaming provider. Try to visit www.deezer.com and then come back here and reload this page, this tells your browser that the cookies coming from deezer.com are "safe"
On most of the recent browsers, you can use Mentor.FM without having Adobe Flash enabled. You might have a browser that needs to have Adobe Flash enabled. Here you can check your Flash installation. The last thing you can try is: delete the Deezer cookies stored in your browser (here you can find instructions for Chrome, or you can contact us using the feedback button on your left), visit www.deezer.com and then come back here and reload this page. You have to do it just once. If you can't solve the problem please contact us. Please also check that your browser accepts Third-Party Cookies. We are developing a new, exciting, feature. You can now discover people (your Musical Matches) who have a music taste similar to yours and get suggestions for concerts to attend with your Musical Matches. Mentor.FM builds a first skeleton of your music profile using your Facebook account, you can improve it by importing your Last.FM and Deezer listening history. Want to add your Deezer history to your Mentor.FM musical taste? If you have enabled Last.FM scrobble on Deezer.com you should import JUST your Last.FM history, which already includes your Deezer history. Want to add your Last.FM history to your Mentor.FM musical taste? Your Last.FM profile must be public. If you think this biography is wrong or not accurate please report it to us, thank you! you have listened to songs , we hope you are enjoying Mentor.FM and we are asking for your very valuable feedback. The feedback of users like you is crucial for us! Thanks for your time. Tell us more about your taste! There is a problem accessing your Deezer history, please try again and if you still get an error please contact us using the feedback button on your left. The username is not a valid Last.FM username or the scrobbles history is empty. You have to use Mentor.FM for a while to enable the Surprise me! channel. Usually 2/3 days of normal use is enough. It is impossible to get your current location. The username is not a valid Last.FM username, the scrobbles history is empty or you set your recent tracks as private. Sometimes also a network problem can occur. Please try again and if you still get an error please contact us using the feedback button on your left. An history import process is in execution, please try later. If you still get an error please contact us using the feedback button on your left. You are going to reset your Deezer history from your Mentor.FM musical taste, are you sure? You are going to reset your Last.FM history from your Mentor.FM musical taste, are you sure? The listening history is empty. We are sorry but at the moment we can't produce a surprise playlist for you, your musical taste is not very clear yet, you can try again now or later and/or increase your Facebook music likes to make the process easier. Click here to to switch back to normal mode. You liked 0 or very few artists on Facebook. Your session has expired, please start a new one. At the moment Facebook is the only way to register and login into Mentor.FM. The preferences used to create a preliminary and first music profile are extracted from Facebook, Deezer and Last.FM and then enriched during the time by the user's behaviour. We can just access the information you agree to share with us when you authorize the Mentor.FM application. Mentor.fm works much better if you facebook like at least some artists who represent your taste, please do it before continuing. Username saved, please set LAST.FM AUTOMATIC IMPORT to Yes to start importing. In the next few hours we are going to import your Deezer history into your Mentor.FM musical taste. A message to will be sent at the end of the process. In the next few hours we are going to import your Last.FM history into your Mentor.FM musical taste. A message to will be sent at the end of the process. You have to type and save your Last.FM username before turning the automatic import ON. Feedback successfully sent, you are a lovely person. Ok, you can always send your feedback using the feedback button on your left. Report successfully sent, you are a lovely person. Remember, you can always send your feedback using the feedback button on your left. Your email address is not valid, please double check. Sorry An error occurred, please try later! Mentor.FM Web version does not work on mobile devices. If you have an iOS device (iPhone, iPad) you can download the iOS app from the appstore. Hi, it seems you are using Safari as browser. We are currently experiencing problems due to an issue of the Deezer SDK with Safari. Please use Firefox or Chrome, the issue will hopefully be solved soon. Hi, it seems you are using Internet Explorer. We are sorry but at the moment Mentor.FM does not work correctly on Internet Explorer, please use Firefox, Chrome or Safari. Hi, it seems you are using Opera as browser. We are sorry but at the moment Mentor.FM does not work correctly on Opera, please use Firefox, Chrome or Safari. In the next page you'll have to follow this registration process. Remember to click on "Register here" and THEN complete the registration with email+password, NOT with Facebook (the Deezer Facebook registration doesn't work properly). Ok, I got it, let's go to the next page now! Hi! We believe that you are in UNITED STATES. Unfortunately, UNITED STATES is not one of the 200+ countries where Mentor.FM is available. If you believe we have made a mistake, please let us know using the feedback button on your left. You can anyway close this window and register to the service, but it won't work properly; you can also discover what is Mentor.FM (watching the intro video and reading something about this service). If you register to the service, we will let you know via email when Mentor.FM will be available in your country. Here is the list of 200+ countries where Mentor.FM is available. Please note that at the moment Mentor.FM is NOT available in U.S.A.